The theory of rational coaching is something that is talked about frequently in fantasy circles. Criminal underutilization is a subjective feeling, but a lot of times it can be backed up by data and film interpretation. Underused in Miami; Bell Cow in Houston? 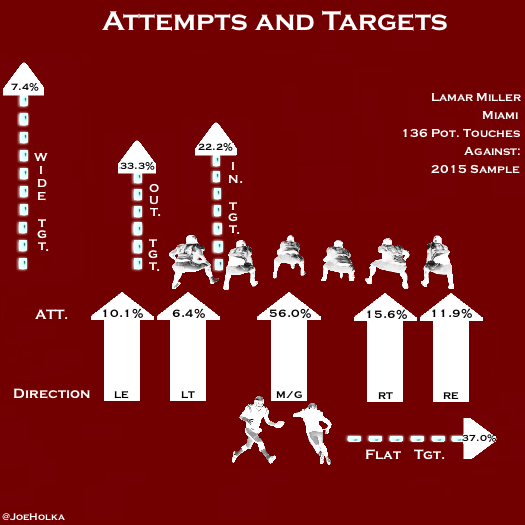 Lamar Miller has been stuck in Miami, playing for a team who gave him an average of only 12.2 carries and 3.5 targets per game in 2015 despite his reputation of supreme efficiency. More on the efficiency narrative later. Miller has proven himself as one of football’s best running backs the past two years, finishing as the RB5 and RB9 in PPR leagues -- despite this lack of volume and in a horrible rushing environment. We know that volume typically leads to fantasy success, but what happens when premium opportunity meets presumed efficiency? We’re about to find out. Miller is now a member of the Houston Texans, a team he shredded for 236 total yards and two touchdowns last season. Seemingly everything about his situation has improved from a year ago. The Texans have made a concerned effort to shore up their offensive line this offseason and protect their $26 million investment in Miller. Signing starters Jeff Allen, Tony Bergstrom, and using a second round pick on center Nick Martin from Notre Dame should vault this line into the top half of the league. Under head coach Bill O’Brien, the Texans have been an extremely run-heavy team that pushes the pace. Houston has finished first and fifth in rush attempts the past two years, respectively. Pair that with a team that has been the first and eighth in offensive plays per game the past two seasons, respectively, and it doesn’t take a genius to realize that this is a prime landing spot for Miller, especially coming from a team that finished dead last in rushing attempts last year. For context, the Dolphins ran 150 fewer plays than the Texans last season, and 128 less rushing attempts. O’Brien has had a 20-touch back in 59% of games since he has been with Houston. He also doesn’t use tight ends very often, just 11.8% of the time, which is half as much as the average team. This could lead to increased opportunities for volume in the short-to-intermediate passing game. Miller showed immense improvement in the passing game last year as he set career highs in catches, receiving yards, and yards per catch. PFF also graded him as a top-three pass blocking asset, which is just another reason he likely won’t come off the field much in 2016. The competition around Miller leaves a lot to be desired. An inefficient Alfred Blue has been serviceable for Houston in the past and would be the most likely to take over early down work and short yardage situations if Miller went down. Jonathan Grimes has shown proficiency in the passing game but will compete for a role with fourth round pick Tyler Ervin, who is a much more dynamic talent. Outside of DeAndre Hopkins in the passing game, the Texans have added Will Fuller with the 21st pick in the draft. This bodes well for Miller, as Fuller is more of a downfield threat that could help open up running lanes, as Fuller has an uncanny ability to outrun coverage. The Texans passed on more complete options at wide receiver and took Fuller, who is not much of a threat threat to eat into Miller's target opportunities. When you watch Miller on film, one thing is extremely evident: this guy has a third gear once he gets into the second level. His elite level long speed and unique acceleration allow him to turn a small crease into a huge gain. 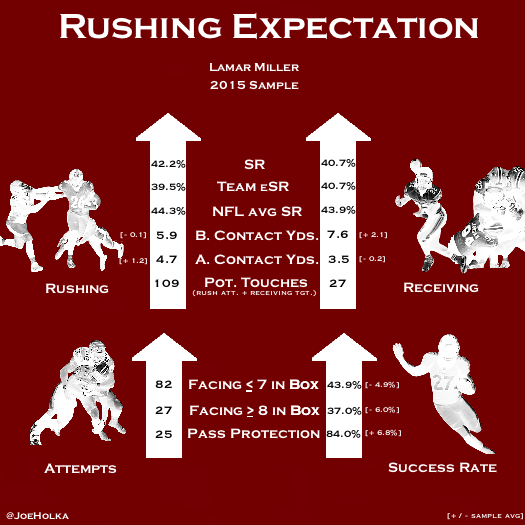 Like many others at his position, Miller’s rush attempts came most frequently through the middle, at 56.0%. He displays above average vision as he approaches the line and does a good job setting up his blockers before explodes through the crease with elite speed. Miller has soft hands and is a rare talent in the passing game. As you can see with his chart, he contributes in a variety of different ways. 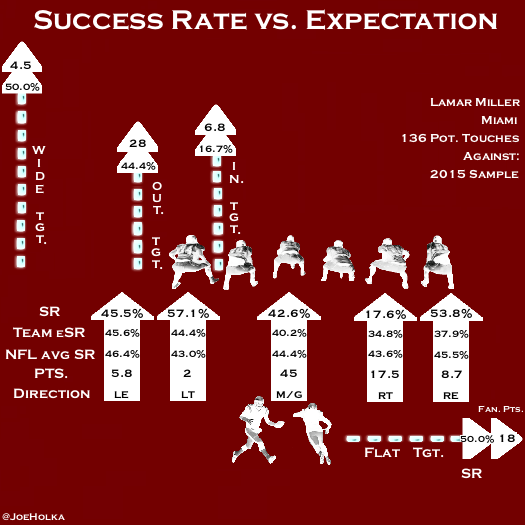 What his chart does not show is Miller’s proficiency adjusting to the football downfield and the ease with which he catches passes in less than ideal locations. Expected Success Rate (eSR) is the signature metric of Rushing Expectation and highlights the fact that not every Success Rate (SR) is created equal. Offensive lines have a direct correlation with running back success and how far a player falls below or exceeds expectation is extremely relevant. If you are new to this series, you can learn more about this metric in my introduction video or article found here. Miller is almost a direct contrast between the last profile, Latavius Murray: Miller has a reputation of great efficiency but a lack of volume; in Murray’s case, it's supreme inefficiency but significant volume. It is not groundbreaking to say Miller is worthy of more touches, but exactly how far did he exceed expectations in 2015 from a metrics standpoint? The overall eSR for Miller and the Dolphins was 39.5% per rushing attempt -- 28th in the NFL and well below the NFL average of 44.3%. The Dolphins weren’t any better in pass protection at 40.7% expectation; the league average is 43.9%. Unlike the other profiles I've done so far, Miller was actually much more efficient in rushing lanes where he saw less volume. This could speak to him being misused in Miami, but he still performed slightly above his eSR through the middle. As far as the perimeter, Miller absolutely tore teams up on outside runs with a combined 49.7% SR (in a small sample) -- nearly 8% above his team expectation through those lanes. This was the only place Miller really blew the doors off from a success rate perspective. Miller has rare athletic ability and above average quickness in traffic when his offensive line doesn’t create large holes. He shortens his steps when he sees trouble and is patient enough to wait for creases. Miller's versatility in the passing game is evident, as he performed above expectation through every route but those ran on the inside or through the offensive line. Miller scored the majority of his fantasy points on outside targets, which can be largely attributed to some big plays after the catch. Two touchdowns accounted for 20.7 of his 28 PPR points on outside targets. He was not nearly as consistently efficient on a per-target basis as his overall yardage and fantasy point totals would suggest. From a success rate perspective, the common perception of insane efficiency may be slightly overblown with Miller. Lets take a peak at his overall results to be sure. Behind statistically one of the worst offensive lines in the league, Miller performed slightly above expectation in his 2015 sample: by 2.7% in the run game, and exactly where he would be expected in the passing game. These numbers put Miller below average from a success rate perspective in regards to what he was expected to do -- securely in the bottom half of my initial 20-player sample, and behind guys like Carlos Hyde, Ameer Abdullah, and T.J. Yeldon. Miller finished in the middle percentile in regards to yards before contact. I weight this stat extremely high in my overall analysis, as I have found elusiveness behind the line of scrimmage to be much more predictive in elite production than yards after contact. Yards after contact can be an extremely misleading stat in my opinion. That said, Miller finished overall in my initial 20-player sample in that category with a full 1.2 yards more per carry than the average. He has very good finish and balance through contact, which is most likely attributed to his low pad level. Miller shows good power in one-on-one situations but tends to run out of bounds easily at times. As a former athlete, this kind of lack of intensity bothers me, though I suppose his impressive durability could be related to the fact that he doesn’t put his body in bad situations often. Personally, I prefer a player that is laying everything on the line each and every play for his team, fighting for extra yardage. Miller's mental processing and vision are above average but not spectacular. He hardly ever makes poor decisions when he can gain positive yardage if he takes what’s there. He also maneuvers through the box well in both loaded and base situations. Miller isn’t a player who is going to juke linebackers at the second level, but his burst is so elite that he can run past people when he is not bouncing off of them. Being an asset in pass protection is an undervalued asset to Miller’s game. He performed well above average in this category at 84.0%. For fantasy purposes, the small holes you can poke in Miller’s game and Rushing Expectation will be overshadowed by his elite opportunity in Houston. Coming from such a poor situation in Miami, Miller is likely to turn that opportunity into big-time production -- and that is even before you consider his immense potential in the passing game. Miller has maintained his fantasy relevance despite a lack of volume due in large part to his ability to score touchdowns. Miller led all running backs with at least 20 opportunities in red zone efficiency last season, converting 30% of his carries into scores. It goes without saying that he will need to continue this positive touchdown trend, but to have a shot at finishing as the RB1 overall, Miller is probably going to need his assumed increase in touches as well. Barring injury, as the lead back in a run first offense and on a team who led the NFL in offensive snaps last year, Miller has to be securely in the conversation for a top-five finish at the position.